We at Harvest Garden cannot maintain this garden alone. Which is why we could use your help maintaining our garden. We provide the gloves,the tools and the instructions you will need in order to assist in our garden. For high school and college students who have an interest in edible gardening, want to help those in need in our community or are looking for ways to buff their resumes and fulfill their community service obligations for school, we have a summer internship program just for you. 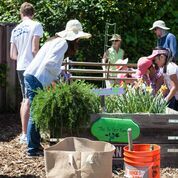 You will learn the fundamentals of organic vegetable gardening from seed to harvest, soil care, crop rotation, vermiculture and play a leadership role in our regular Sunday Workshops. Internships run from June to September and include hands-on gardening Wednesdays and Sundays. Vacation plans can be accommodated. Sunflowers sprouting from last year’s harvested seeds!